Alina performed on Show 252, recorded in April 2012, at age 16. 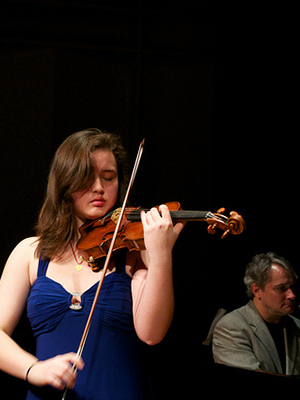 Alina Ming Kobialka (violin), 15, is from San Francisco, California and attends the Ruth Asawa San Francisco School of the Arts. She studies with Wei He at the San Francisco Conservatory and is the co-concertmaster of the San Francisco Symphony Youth Orchestra. Alina has attended the summer program at the Hotchkiss School in Connecticut. Aside from the violin, Alina loves exercising, quiet walks, reading and swimming.